to foster public appreciation, awareness and community development through cultural events. Ted Alcuitas - Ted Alcuitas is a journalist and publisher who has been covering Filipinos in Canada for over four decades. Ted founded Silangan, one of the first Filipino newspapers in Canada in the 1970's in Winnipeg, Manitoba. He moved to the West in the 1990's where he continued to write for Filipino newspapers in BC. His writings have appeared in the Winnipeg Sun, Vancouver Sun, the Philippine Reporter, Bulatlat, and Philippine Asian News Today. Ted’s extensive knowledge on the Filipino diaspora in Canada makes him a go-to source for information and analysis. Ada Con - Having worked for the Fraser Valley Regional Library from 1975 to 2013, Ada was the manager of the Terry Fox Library for 20 years before coming the Coordinator of Diversity Services and Programming. As coordinator she created a number of award-winning library programs such as the Reading Link Challenge and the Festival of Aboriginal Artists. Sean Gunn - A former member of the board of directors of the Chinese Benevolent Association, Sean is also a founding member of the Asian Canadian Writers' Workshop. His musical career includes playing in the house bands of Vancouver Chinatown's infamous strip joint, the Kublai Khan, and famous night club, the Marco Polo. Sean has composed music for the feature-length films Moving the Mountain, and Fishbones. He has performed with the Asian Canadian alternative folk-rock bands, "Number One son," and "Raw Silk". His poetry has been published in the anthologies, Inalienable Rice and Many Mouthed Birds. Vanessa Lowe - Vanessa Lowe is an artist and writer who lives in Vancouver. She has a degree in English Language from the University of British Columbia, and is working on a BFA from Emily Carr University. She provides full time care for her invalid mother. She writes in her blog, thiscassandra.com, occasionally. She sings with the Woodwards Community Singers. She is learning to play piano. She likes to travel. Her art and her writing are about place. Eric Li - Eric is an upstart writer who participates vociferously in community cultural events. He composes poetry in transit and is founder of the Turtle Embassy, an initiative to promote the awareness of responsible turtle habitats. Nick Stember - Nick is a translator and historian of Chinese comics. In 2016 he completed a Master of Arts in the Department of Asian Studies at the University of British Columbia with his (very readable and not at all obscure) thesis on the formation of the Shanghai Manhua Society in the mid-1920s. Since 2014, he has worked as a consultant for a variety of ventures, including Storycom and Clarkesworld Magazine’s Chinese Science Fiction Translation Project and the Grayhawk Agency and the Ministry of Culture (ROC)’s Books from Taiwan. He currently serves as the translation editor for Ricepaper Magazine, and commissioning editor for the Los Angeles Review of Books China Channel. Sid Tan - Sid is a founding director of the CMES Community Media Education Society and Asian Canadian Writers' Workshop. He is a community activist concerned with environmental and human rights and social justice issues. He has produced and crewed hundreds of hours of community television programming, much of it national and international award winning. He is presently co-chairman of the Sierra Club Lower Mainland Group, a director of the Sierra Club of British Columbia and Vancouver Association of Chinese Canadians and acting chairman of the Media Caucus of the British Columbia Environmental Network. He is active in ICTV, an Independent Community Television Co-operative in Vancouver. Todd Wong - Currently the longest serving ACWW Board member, Todd helped create ACWW's inaugural Community Builders Dinner in 2002. 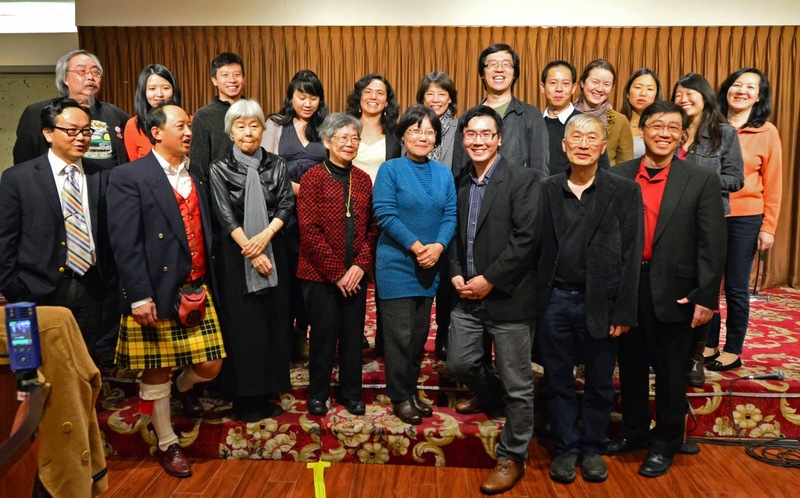 A 5th Generation Canadian in inter-cultural Vancouver, Todd can be seen in the CBC TV documentary Generations: The Chan Legacy, which he consulted on about the life and descendants of his pioneer great-great-grandfather Rev. Chan Yu Tan, who came to Canada in 1896. He has documented lots of Asian-Canadian history as one of the first Asian-Canadian bloggers atwww.gunghaggis.com (Todd is an avid blogger at Toddish McWong’s ) Gung Haggis Fat Choy, "Toddish McWong's Robbie Burns Chinese Ne Year Dinner has become (in which he is also founder and organizer of) one of Vancouver’s most celebrated annual intercultural gatherings, and has inspired a CBC TV performance special, a similar version at Simon Fraser University, and ACWW's Hapa-Palooza Festival . Todd is also Chair of the Historical Joy Kogawa House Society, where he helped to save author Joy Kogawa's childhood home into a Canadian landmark with a writer-in-residence program. Todd is also a co-author in Eating stories: A Chinese Canadian & Aboriginal Potluck. Kristen Wong - Kristen is her family’s historian, researching and discovering stories once thought forgotten. Through her research, she has learned of her great grandfather’s time as a coolie worker in Mexico as well as her grand-uncle’s career as a teacher in Vancouver during the Chinese Exclusion Act. These are the stories that inspire Kristen's writing, and she believes that history and historical fiction is a fun way to engage children in learning more about their families and communities. An advocate for both the power of history and literacy, Kristen has worn many hats. She was a coordinator for the Robson Reading Series, a volunteer in child literacy programs, treasurer for the Vancouver Historical Society, and a copy editor for Ricepaper Magazine. She writes in different media, including a humorous blog, short stories, essays, and storytelling through games with a focus on collective memory and interpretations of history. Besides historical elements, Kristen enjoys crafting powerful female characters and female-driven narratives. She obtained a degree in history as well as ancient literature and mythology from the University of British Columbia and is currently completing a certificate in game writing. Jim Wong-Chu - A pioneer of Asian Canadian literature, Jim is a poet whose book Chinatown Ghosts (Arsenal Pulp Press, 1986; now out of print) was the first poetry book by an Asian Canadian writer. In addition to co-editing Swallowing Clouds with Andy Quan, he co-edited the fiction anthology Many Mouthed Birds with Bennett Lee. Jim is also the founder of the Vancouver Asian Heritage Month Society. Jim passed away in 2017.